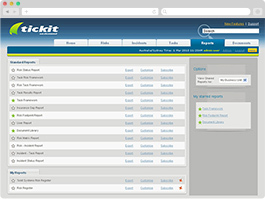 Being a Software as a Service GRC solution we have the advantage of fairly rapid release cycles for Tickit On Demand. This means we can be quite responsive to the needs of our customer base and deploy great new features to them quite quickly. Our challenge has been how to keep our customers informed of new features so that they can take advantage of them. We used to send out email based release notes telling customers what is in a new release. This works well for some customers but for others, these release notes were just not getting the message across fast enough. As a result, some of our customers were missing features that could be really useful to them.